An outstanding researcher and world-renowned advisor to the Antarctic Treaty System, Professor Steven Chown was the inaugural recipient of the prestigious Martha T. Muse Prize for Science and Policy in Antarctica. The prize was awarded at the recent IPY Oslo Science Conference. Professor Chown is a widely published and cited authority on invasive species and the effects of climate change and human interactions on Antarctica. He will also be a guest of honour at the SCAR Open Science Conference in Buenos Aires in August 2010. In this interview, SciencePoles questions him about both his scientific and preservation work. 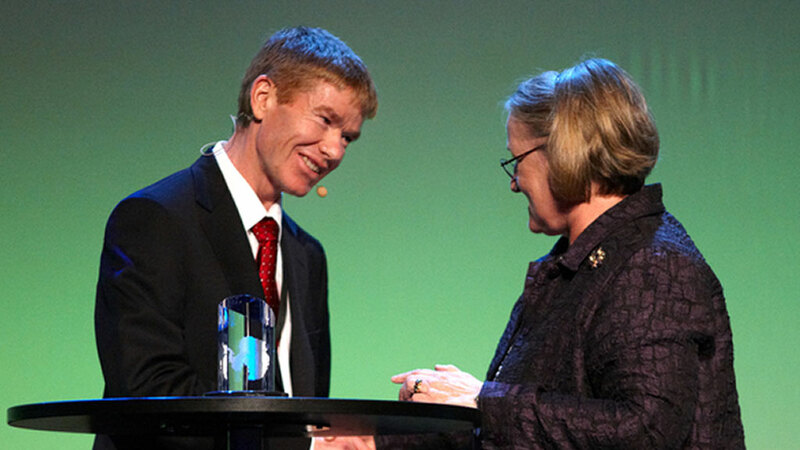 First of all, congratulations for receiving the fits Martha T. Muse prize for Science and Policy in Antarctica. Was it a surprise? Yes, it really was. I knew that I had been nominated, but I had absolutely no idea that I was in the running for the award. The prize is for excellence in science, but also in the preservation of Antarctica. Could you summarize your work in both of these fields? For some time now, I’ve been working on a Sub-Antarctic Island called Marion Island, which is about 2500 kilometers southeast of Cape Town. But with the Australians and the British, we have also been looking at other islands in the Southern Ocean. On these islands, climate change and preservation are deeply interlinked. On Marion Island, because we have a long climate record, we’ve been able to watch what that change is doing to biodiversity, mostly in terrestrial populations, which is our focus. This includes plants and small insect-like animals called springtails, as well as an interaction between species that are invasive to the islands. Because of past human activities, non- indigenous species were brought in accidentally, and we know they have an impact, but what we have been particularly interested in is how that impact will interact with climate change. Will the invasive problem become less, or will it increase with changing climates? That has been a major focus of work and research. And what have you found out? One of the things we confirmed is that the more people you have in an area and the more visits, the greater the number of alien species you end up with. What we’ve done after that is to try to understand how they are distributed, and what drives their distributions on particular islands. It turns out that climate is really important. In really cold areas, it’s very difficult for temperate species to become established, especially if you consider that the ports of departure (whether it’s an airport for flights into the Antarctic or whether it’s a ship) are actually much warmer than most of these areas, so the organisms are often not adapted to the low temperatures. But some of them are, and of course the interest is to find out to what limits. Evolution is really important in this. Even though you may have an organism that struggles initially, we need to understand to what extent it can change so that it adapts to the local conditions. What are the physiological aspects that react to the environment? How do they evolve? What are the risks? Yes, the nations that signed the Antarctic Treaty and the Madrid Protocol to the treaty elected to protect the Antarctic environment and what they call its associated independent ecosystems, which are these islands. And so you have to understand what these threats are, and one of the major threats that have been identified is non-indigenous species. For example, in monitoring what scientists call propagules (seeds or reproductively capable individuals), we’ve been looking at vectors, such as what items of clothing might have the highest loads and what pathways (ships, containers, etc.) actually carry the most species - and what we can do to reduce that. For example: Can you wash your clothes? And the answer is of course that you can. But to stop seed grass you have to wash outer gear at a temperature above 40º or 50ºC. But as soon as you do that, you ruin the waterproofing properties of your gear so you have to look into alternatives… These are the kinds of practical problems we are looking at. What makes Marion Island more interesting than others? Or is it just a question of access? There is always a practical element to science, and of course South Africa, where I come from, has a strategic interest in Marion, which it annexed in 1947. Whilst it’s convenient to work there and it’s possible to get funding because it’s a national priority, it’s intellectually interesting for me because it can help to resolve real scientific questions and problems. Marion has a steep climatic gradient, and a limited number of species, so unlike South Africa where there a hundreds of interacting species, on Marion, the number is small enough for us to be able to understand these interactions. When did the first invasive species come in? In the 1940s. At that time, the British government and the South African government were still thinking about strategic issues, and they agreed that having security of the Cape sea route was very important. So it was annexed by the Australian government. Soon after they realized that it was very useful for weather forecasting, and they set up a meteorological post there. And then they realized that it was an immense biological paradise worth conserving, and that is how we have come to have a station and a reserve there. Is it reminiscent of Charles Darwin and the studies he did on the Galápagos Islands? Is Marion Island serving as a similar kind of tool for you? Yes it is, in some sense. The Galápagos are interesting because there are so many islands and a great deal of differentiation and speciation between them, so they are a fantastic model for understanding evolution. There are fewer islands in the Marion group, but yes, it’s a good example of an open air laboratory: a kind of ecological Galápagos with the evolutionary aspects not quite as predominant, although there are some subtleties that we are just starting to understand now with genetic techniques. In what way does Marion Island serve as a model for what may or may not be happening on the Antarctic mainland? The Antarctic continent is vast and not the same kinds of changes are happening everywhere. The Antarctic Peninsula is warming and changing the fastest, whilst the rest of the continent is much more stable, and in some parts, actually cooling a bit. The peninsula also has the highest numbers of visitors from researchers and tourists, so the expectation is that we will have this interaction between non-indigenous species and rapid changes in climate. Thanks to the work we’ve done on Marion Island, the Committee for Environmental Protection <> now knows what to expect, and also what questions to ask and consider: How do we decide on whether to eradicate a species? Can you preserve a system just as is? How do you tell the difference between what humans are doing through their local actions and what’s taking place as a consequence of this broader scale climate change which is then allowing natural colonization? These are really thorny issues from a management perspective because you can’t really stop ecosystem development. But at the same time you don’t want just to end up with a kind of suburbanization of biodiversity with lots of alien species across the continent instead of, lets’ say, just neighbouring South American species. Looking more specifically at cooler environments than those found along the Antarctic Peninsula, is there really a lot of scope for the establishment of alien species in such cold places as say, Dronning Maud Land? The probability is of course much lower than on the peninsula, but you still have the issue of people bringing in things from the outside and moving them around the region between local environments. For the Dronning Maud Land in East Antarctica, for example, I think that is the largest risk. It’s really quite a cold place and hasn’t changed that much in terms of things coming in from temperate areas. But how we move between nunataks (tops of mountains sticking out over the surface of the ice sheet), for example, and what risks we pose – this is what we are most interested in understanding when it comes to such cold regions. What was your involvement in the Aliens in Antarctica <> International Polar Year (IPY) project? The Aliens in Antarctica project sought to identify the full scope of human activities and paths of human entry into Antarctica, so that we might provide information on how we need to manage these risks. My role and influence was in discussing the structure of the project with the key people in it. We were also responsible for undertaking the South African sector of the work because that is a major area of departure for Antarctica, with flights from Cape Town into the Dronning Maud Land, and our own operator working out of Cape Town. We also looked into the identification of seeds brought in by humans. Now we're working on the analysis of data and writing up our findings. You are chief officer of the SCAR Antarctic Treaty Standing Committee,. How does that help you in your work and conservation mission? What it has certainly done is highlighted what managers need to know and the fact that what we in science think is perfectly self evident doesn’t often translate into legally binding policy very easily. This gives me a totally different perspective on how far science sometimes has to go to actually make it into a policy framework that people can understand and relate to, and from which they can develop some kind of regulatory framework. You really have to put a lot of energy into helping translate the science into policy, and from my perspective, if you work in a region and you think you want to help keep risks down and conserve the region, you really need to understand that science policy link. My work with the treaty has helped me do that. It’s very educational and you learn from all sorts of people. What does the future hold for you post IPY? What the IPY and this particular conference have opened up is some real dialogue about what we can do in terms of understanding biodiversity in continental Antarctica, particularly in the Dronning Maud Land, which isn’t well understood spatially. There is a convergence on the same kinds of ideas of how to use spatially explicit information so that we can better manage the continent and its surrounding system, and there is a huge amount of exciting and interesting work to do to understand that. And there are new tools as well? Yes. For example, through genetic material (DNA) in the soil, you can tell what kind of diversity you have, how different it is between sites, and how diverse species are between different regions. Then you can overlay that with all sorts of environmental data and use powerful models not only for predicting the area, but also for understanding the landscape, and then doing conservation planning using those. Even economics can be built into these models, so you can start understanding what the cost of your actions might be. Earth observation is becoming increasingly useful for glaciology and the physical sciences. What about in your field? There is huge application for satellite technology in our field. For the islands, we have already been using satellite imagery to understand the distribution of species and how to map them. Researchers working in the McMurdo Dry Valleys have been using infra-red channels on satellites to understand temperature variation and ground tracing. As temperature influences organisms, you can start to understand why distributions are occurring the way they are. During your acceptance lecture you pressed the fact that polar scientist cannot be content to just do their science, but also need to get more engaged in communicating their findings. Can you tell us why? In most cases, science funding comes from governments, and hence from citizens. So we have a duty to say that there is a problem, and that it’s going to take some real effort to solve it. Debate is healthy, of course, and there are items that still need to be debated, but there are some pretty clear indications, very well supported by science, and we have to go out and say this. Some scientist will say that this is not their role. Well, I think some scientists actually have to get into the policy business, even if it’s not everybody’s role. I think that where you have clear evidence supported through multiple studies, you actually can’t afford to sit back and say “well I don’t really want to become engaged with you”. You have to communicate the message. I think it is socially irresponsible not to do so.